By Reina in Around Asahikawa, Transportation Guide on February 28, 2017 . 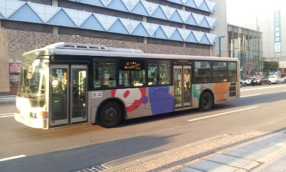 In this article, I want to introduce the bus system of Asahikawa and bus stops that matter for your time here. When you come to Asahikawa, it might be hard to find the bus stops and which bus number you should use to go to Hokkaido University of Education at Asahikawa from Asahikawa station. There are three buses to go my university, numbers is 5,14 and 24. 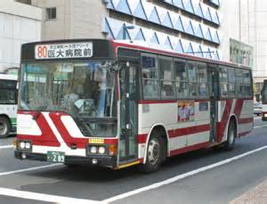 But before you hop onto any bus, you need to make sure it is the right company You should use the Asahikawa Denkikido. The bus color is red. The Green buses are a different company (Douhoku bus). 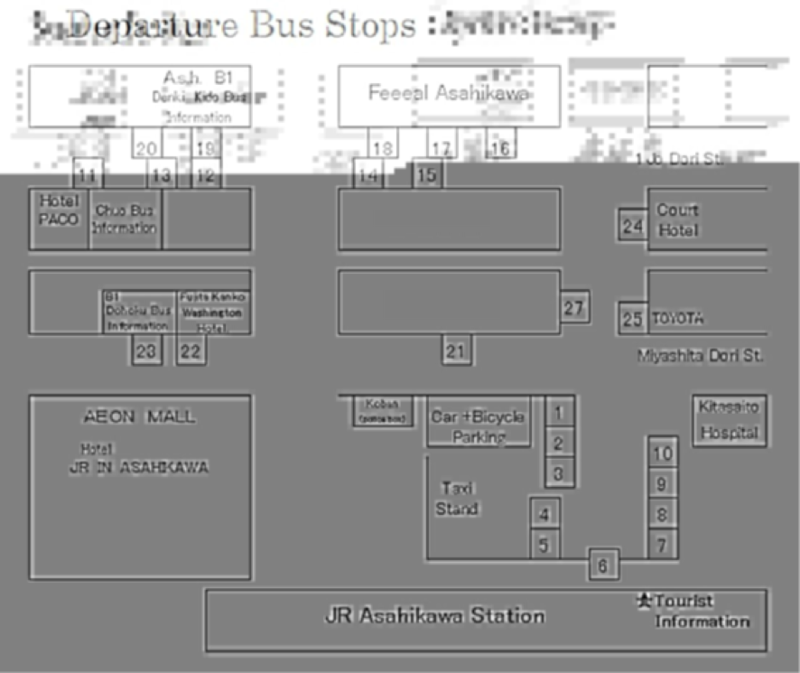 Nowadays, Asahikawa Denkikido has red buses amd ones that are mostly gray as in the pictures above. 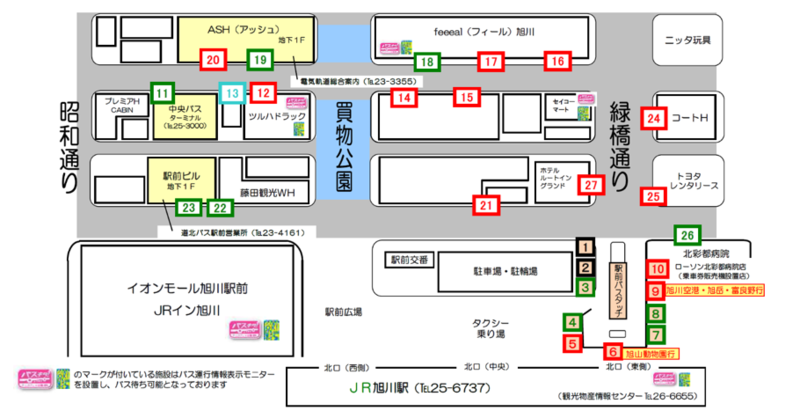 To get to the university, you should go to number 14 bus-stop which is placed at Asahikawa city 1 jo 8 chome. Now, this building ( please look at the picture below ) in on the construction. If you are going to Asahikawa Nishi AEON, you also should go to the same bus-stop, but you don’t use the same buses go to my University. You can use the number of buses 3, 14, 24, 33. If you follow the URL, you can know the time the buses leave the station to University or arrive at the station from University. After reading this, if you don’t understand what to do, then you had better go to ASH. There is the bus informatio center in ASH. ASH is placed at Asahikawa city 1 jo 7 chome. 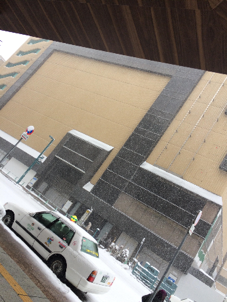 Moreover, be sure to check when the university opens because one of my friends arrived at the university before it opened and it had to wait outside in chilly Asahikawa. (This diagram is in Japanese but the blue part is the wide area for walking we call kaimono koen and the part at the bottom is the train station. To get to the university you want to use either the Red 5 (for the #5 bus) or the Red 14 (for the #14 bus). (The numbers are just by coincidence correct).